I've used Bandicam for years and I love it. There's no ugly cluttered UI or silly integration, it just does what it sets out to do and it does it well. However there is one thing that bothers me and has done for a long time and that is hooking. As it currently stands, if you have multiple interfaces that can be recorded, like for example EA's Origin or the Warframe launcher or other graphical launchers, you end up with a scenario whereby the game you launch afterwards doesn't get priority by Bandicam and therefore you cannot record what you set out to record (even if the window holding said recording priority closes after launch of whatever game it is you wish to play). The only remedy to this and it is a very tedious one (especially since I've had to do it about twenty thousand times over the last few years) is to close Bandicam off entirely and relaunch it, usually with a bunch of alt-tabbing in between. The same hooking issue occurs after the computer has been in sleep for a long time though this doesn't happen to all games. Can we have a selector of sorts to target the game window? This close + relaunch thing is driving me insane and I'm surprised it hasn't been dealt with yet. Another thing I'd like to ask while I am here: Can we please have a better graphical FPS counter? At the moment it is a huge, giant, eye-blinding green/red number. I'm only playing at 1080p and it's pretty eye-catching and I often question the need for it to be so large. To be frank, it should be half the current size or at least have the option to be so, maybe even have some opacity for the counter? I'm also trying to get an issue with hooking resolved, but what I would suggest doing for one of your issues is to add apps like Origin and any other launchers to the blocked process list so Bandicam doesn't hook them. That's useful, thank you. If they don't solve this issue though I'd appreciate a file-tree in the block process feature. At the moment, if you have multiple applications vying for recording/hooking priority, alt-tabbing doesn't work; queue the need to restart Bandicam. A game/app selector from the game mode box on the main interface would be ideal, just like the main interface has options when clicking on screen recording mode and device recording mode. Until this is addressed I'll use the block method. We recommend you use the hooking block function as Xiphan suggested. We have tested with Warframe and we were not able to recreate your issue with its launcher. Could you please explain how to recreate it step by step so that we can investigate it further? Pretty simple to recreate. Using Windows 10 64 and the latest version of Bandicam, launch Warframe and it hooks the launcher. I use the block process feature and I can happily avoid this issue with the Warframe launcher so I don't need help with this. 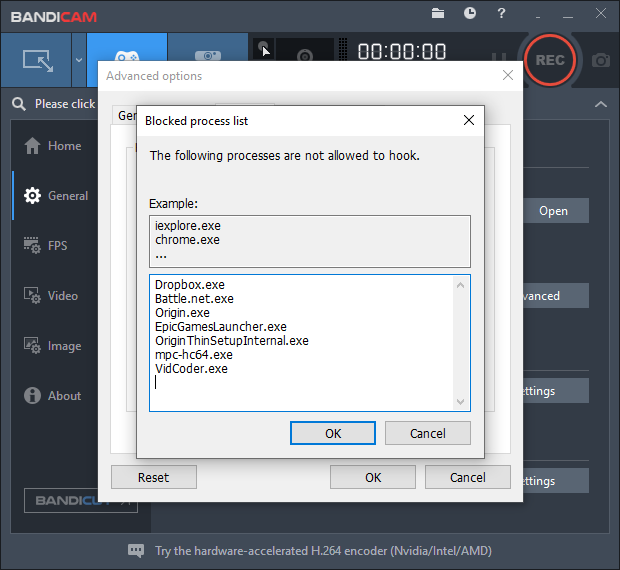 However what has become irritating over the years is when Bandicam has multiple applications that it can hook into - you can't choose which target you want. You either have to close something else off, or relaunch Bandicam and alt-tab back into a game after doing so. Turn your PC on. Launch all your favourite digital distribution platforms and any other daily programs you use. Launch Bandicam, etc. Go play a game. Then, go away and let the PC go to "SLEEP" or manually put it in sleep mode yourself. Come back 30 minutes or so later, wake the PC and then immediately launch a game and then tell me that it doesn't have issues hooking into certain games. It does. I've had 3 different setups this has happened on with varying hardware, different drivers, different OS versions, etc over however many years it has been now. I highly doubt that it has anything to do with my end. The only thing missing that would complete Bandicam and round it off nicely is the ability to select the target process from the UI for any application using Direct-X or OpenGL and is running and present on the taskbar. If this isn't possible, then fair enough, I'll continue with the need to quit the application and relaunch it to target an active window I want. We're sorry that we couldn't produce the issue with your tip. It is possible that Bandicam loses the hooking target if the recording is not refreshing/responding or Bandicam couldn't get proper data from the computer. We will forward this issue to the development team.